If you’re looking for a pickup that can tackle the toughest jobs with ease and pamper you on the ride home, the 2018 Ram 1500 and the 2018 Ford F-150 have been go-to workhorses of discerning Americans for decades. But which one provides the comfort and capability you want at a price you’ll love? 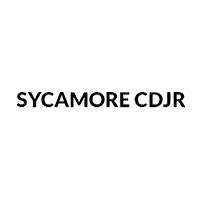 To help you decide which one is best for you, the truck experts at Sycamore Chrysler Dodge Jeep Ram in Sycamore, IL have researched each model and compared them head-to-head. For the purposes of this comparison, we will be taking a look at the 2018 Ram 1500 Express Crew Cab V8 with a 5-ft. 7-in. box starting at $36,940 MSRP and the 2018 Ford F-150 XL SuperCrew® with a 5-ft. 6-in. box starting at $35,225 MSRP. Do you already know the 2018 Ram 1500 has everything you need to improve your daily commute? Give our team a call at ​815-384-2119 or use our online contact form to get started on taking one home today. If you’re looking for maximum capability and performance, then the 2018 Ram 1500 is exactly what you need to get the job done. The legendary 5.7L HEMI® V8 equipped with the 2018 Ram 1500 will provide you with more power, towing capacity, and maximum payload than the 3.3L V6 found on the 2018 Ford F-150. Take a look at the table below to see what each truck has to offer. 410 lb.-ft. Torque 265 lb.-ft.
10,390 lbs. Towing Capacity* 7,400 lbs. 1,710 Payload Capacity* 1,700 lbs. When you work hard you want to be sure your truck will keep you comfortable and content on the drive home. While the 2018 Ford F-150 provides the bare minimum, the 2018 Ram 1500 is available with everything you need to enjoy trips of any length. 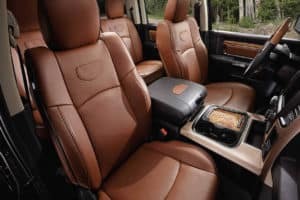 Take a look at the features that you will find on the 2018 Ram 1500 that you’re sure to enjoy. 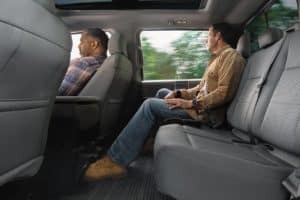 Now that you know the 2018 Ram 1500 offers everything you need to increase productivity while enhancing your daily commute, it’s time to find out just how affordable it is to take one home from Sycamore Chrysler Dodge Jeep Ram in Sycamore, IL. Take a look at our factory incentives and special offers, and then apply for financing online to get a head start on the ownership process. Don’t hesitate to give us a call at ​815-384-2119 or use our online contact form to get in touch with our finance team.